Summary: The marketing-services group had already alerted investors to these disappointing figures. However, the setback was explained honestly by management and I note 50% of the business continues to grow at a fair rate. So everything does not appear completely lost just yet. That said, adopting the tag of industry ‘pioneer’ will always court competition and it seems rivals have tempted some customers away. The share price has been thumped since the summer, but is now looking quite interesting. I continue to hold. SYS1 said these first-half results “were as unexpected as they were disappointing”. True, a profit warning in August had set the scene for the disappointing figures. Well, June’s annual results had already admitted first-quarter trading had been “a little slower than expected”. I dare say SYS1’s executives were feeling a little nervous about this H1 performance back in June. Anyway, the headline figures showed gross profit — which is SYS1’s main top-line indicator — down 9% and operating profit down 70%. The only notable number to maintain its level was the 1.1p per share dividend. “First, several significant FMCG clients have cut or deferred market research budgets, which impacted our Innovation business in particular. Second, underlying and ongoing shifts within the industry backdrop are resulting in clients moving research spend towards automated lower cost research data. Whilst we have seen this trend over a number of years, it has gathered pace more recently. I’m concerned most about the second of those three reasons — more on industry change in a minute. Meanwhile, the first reason appears to be a wider customer issue, while the third seems to be a temporary company-specific situation. The finer details of the statement provided some hope for shareholders. Add back that £520k and operating profit for the half rises 62% to £1,360k. True, £1,360k still a long way off the £2.8m reported for H1 last year, but it is well above the “break-even” performance cited within August’s profit warning. There’s also the fact that a significant part of the business continues to grow. 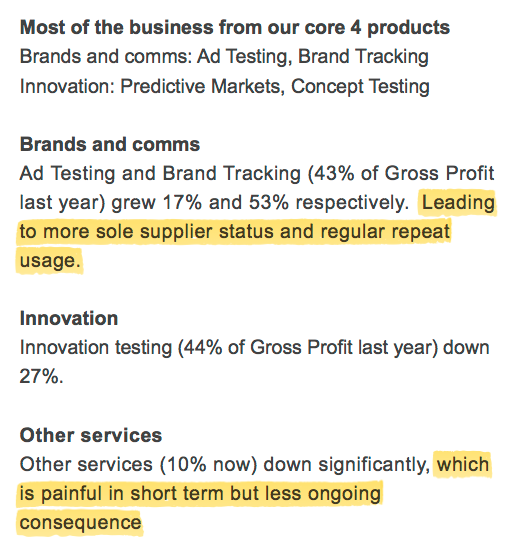 I think the stability may in part be due to Ad Testing and Brand Tracking generally evaluating established client products, while Predictive Markets and Concept Testing involve client products that have yet to be launched. I’m hopeful Ad Testing and Brand Tracking can continue to expand and offset any further difficulties within the other divisions. I have ignored this H1’s performance of the ‘Other’ lines of revenue as these are being wound down and are “not of particular consequence”. * Has lots of change meant the moat has been breached? Such ‘change’ has been a regular feature of SYS1’s history. 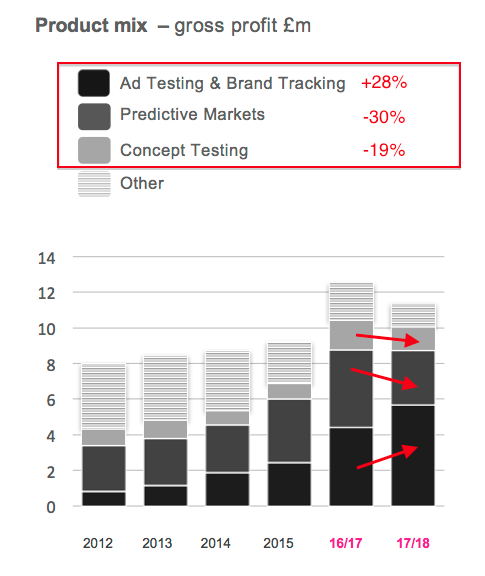 As the main Ad Testing, Brand Tracking and Predictive Markets services have become more popular, certain other products have been dropped or altered. “We have responded promptly to the poor results and shifting industry backdrop, with fast-tracked product development. “Predictive Markets, our largest single product (32% of our business in 2016/17) grew 19% (compared to 2015/16). This was achieved despite pricing pressure, which we have been addressing with a lower cost and cheaper-to-deliver “express” version of the product. All in all, I get the impression some parts of this business are much more susceptible to ongoing competition than others. “We will continue developing the business as we have been, and in this way, will continue to build what some call the moat, or competitive advantage, protecting our business. …may now have to be reassessed. “[…] We are more cautious than usual on our short-term outlook. The encouraging signs we referred to previously continue, but trading in Q3 to date has not yet resulted in a pick-up in our order book. SYS1 had previously suggested full-year pre-tax profit could decline by between 10% and 15%, but I had already sensed that projection may have been too optimistic. Profit before tax falling by the 55% mid-point would deliver earnings of about £1.8m — or 14.6p per share — after applying this H1’s 36% tax rate. Factor in a £3.5m (28p per share) cash position and the 400p shares could therefore trade on a P/E of around 25. Clearly the market expects earnings to recover, and SYS1 (as BrainJuicer at the time) did rebound very quickly from a setback during 2012. Back then, earnings fell from 14.8p per share to 8.3p per share, only to surge to 19.4p during 2013 and then to eventually rise beyond 30p per share. However, the 2012 setback was limited to just a few months of slow trade. The current difficulties seem to be lasting a bit longer. Let’s assume it takes three years before SYS1 regains its peak 2017 earnings of 34p per share, during which time the share price rallies to 680p and a 20x multiple. Would that potential 280p upside from the present 400p be enough to offset the risk of further trouble, or the recovery taking longer? I am not sure. 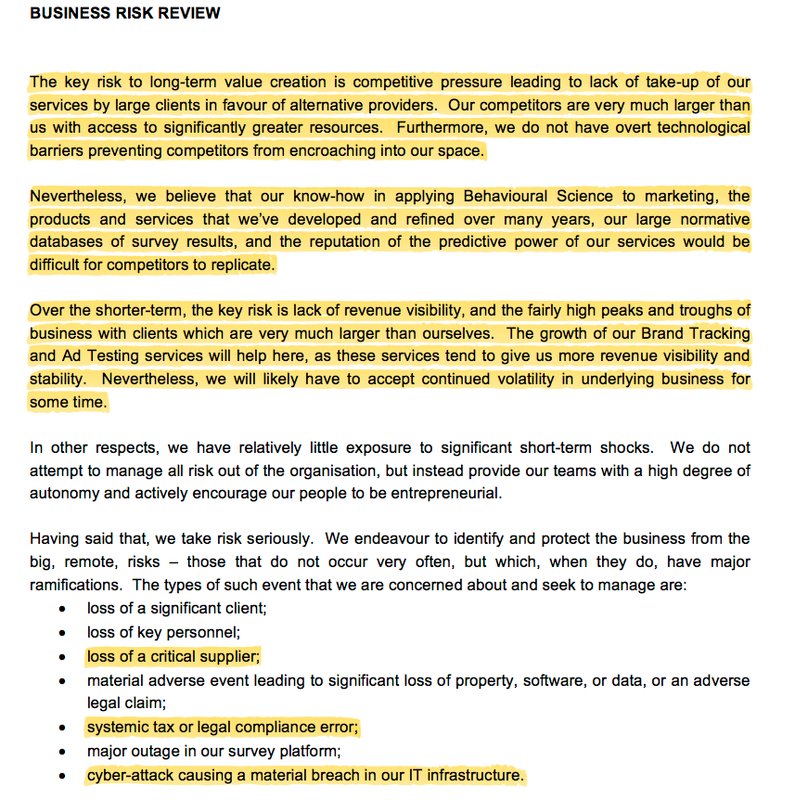 But what I am convinced about are SYS1’s underlying attractions, not least the company’s proven history of expansion, focus on long-term organic growth, evangelical boss and very straightforward, cash-rich accounts. I am always looking to top up on my smaller holdings and I dare say I could buy more of these shares if the price goes lower. In the meantime, the 7.5p per share trailing dividend supports a modest 1.8% income. As announced on 27 October 2017, cuts and deferrals to some major FMCG client marketing budgets meant H1 trading was less than expected with Gross Profit (the Company’s top-line performance indicator) 9% down on prior year (12% in constant currency). Q3 trading continued to be worse than anticipated and, subject to its normal lack of revenue visibility, the Company now anticipates Gross Profit for the year to 31 March 2018 will be around 20% less than the prior year. As the year has progressed, the Company has taken steps to reduce overhead cost growth. After overhead growth of 8% in H1 (with investment in headcount growth in the US and the Advertising Agency), we anticipate overhead growth over the year as a whole in low to mid single digits. On this basis the Company expects Profit before Tax for the full year to be a little over break-even (2016/17: £6.3m). The Company has responded to the cuts in client budgets by re-engineering most of its mainstream product offering into a faster, cheaper, more outcome orientated, ‘Creat1ve Guidance System’, reducing cost growth and restructuring. This is with a view to selling and delivering larger-scale, more automated, on-going programmes of work. In addition, System1 Research is investing in establishing a new industry standard of ‘Advert1sing Quality’ to be launched in January 2018 in support of its Advertising Research business and to create new revenue lines. These larger-scale ‘Creat1ve Guidance’ programmes take time to sell, but positive discussions with a number of the Company’s large corporate clients are ongoing. The Company believes the new offer and structure, together with the ‘Advertising Quality’ standard, will return System1 Research to growth in 2018/19 and provide enhanced visibility and stability to revenues. During the year, System1 Advertising Agency has won its first clients in Continental Europe and the US and is on track to be close to break-even in Europe and to make an anticipated small loss in the US. The Company believes System1 Advertising Agency will be profitable in 2018/19. The Company’s cash position remains sound. As at 31 December 2017, there was a cash balance of £4.6m and no debt. SYS1 now expects profit before tax for the year to March 2018 to be “a little over break-even“. That compares with a possible 50% to 60% decline suggested in the H1 results reviewed in the Blog post above. Let’s not forget that SYS1’s trading update last August had indicated full-year pre-tax profit could be between 10% and 15% lower. So SYS1 has regularly downgraded its expectations for the current year. I would like to think with three months to go to the year end, the firm may now have a more realistic grasp of its near-term performance. Anyway, this latest update indicates gross profit could fall 20% and overheads could rise “in low mid-single digits” for the full year. My sums suggest gross profit would come in at £21,587k and overheads (assuming a 3.5% increase) come in at £21,400k — thus leaving a £187k profit (which is indeed “a little over break-even“). The figures imply a poor performance for the second half. 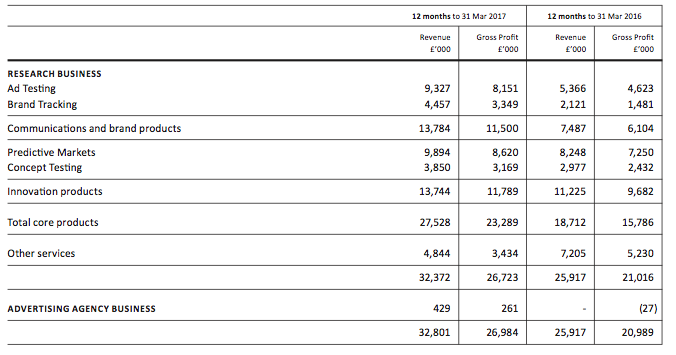 I reckon H2 gross profit fell from £14,443k to £10,193k — almost 30%. It seems H2 overheads may have been trimmed by about £100k to £10,846k, so giving an H2 loss of (£652k). Oh dear. Well, the H1 figures within the Blog post did not exclude severance costs and rebranding costs from the main overhead charge. I’m therefore hopeful there could be some further ‘sand-bagging’ of the full-year profit numbers with other ‘one-off’ costs. In fact, SYS1 had predicted a break-even-ish performance for H1, and yet profit before ‘one-offs’ came to £1.5m. Also, I see cash at Dec 31 was £4.6m. Cash was £3.5m at Sep 30, so at least the business continues to generate cash during what was probably an awful Q3. That said, there is no disguising the fact that a near-30% H2 gross profit slump is a poor performance. One the one hand, it is encouraging to read SYS1 is responding to events. But on the other hand, “re-engineering… most mainstream product offering” does sound like there has been a complete overhaul of SYS1’s services. Such actions appear very dramatic given the reference to “cuts and deferrals to some major FMCG client marketing budgets“. I would have thought that a broader industry slowdown would not necessitate a complete product overhaul. I get the impression the overhaul may be more to do with growing competition for SYS1’s services. Judging an attractive valuation remains tricky with near-term earnings so depressed. A 340p share price supports a £42m market cap. The £4.6m cash represents 37p per share. SYS1’s projected 2018 gross profit of £21m was achieved by the firm during 2014 and 2015, during which time operating profit came in at approximately £4.5m. If gross profit remains low and SYS1 can cut its cloth accordingly (and ditch some of the new, costly recruits to reduce overheads and increase margins), then a market cap of £42m (and enterprise value of £38m) could be attractive. I will have to do more sums. SYS1’s previous three statements (August, October and January) had each reduced profit expectations for 2017/18. So I am pleased this statement lifted expectations. As previously announced, trading during 2017/18 has been disappointing. Gross Profit (the Company’s main top-line performance indicator) declined by some 18% (17% in constant currency) to £22.2m. The Company has responded with new product offerings and reductions in its cost base. After 8% Overhead Cost growth in H1 (vs the comparable prior-year period), Overhead Costs over the year as a whole have declined by approximately 2%. This decline in Overhead Costs is due in part to a decline in Share based Payments (following the sharp fall in the Company’s share price over the last twelve months), from £0.7m last year to approximately £0.1m this year, and in part to a reduction in employee bonuses from £2.3m last year to less than £0.1m this year. It also reflects a reduction in headcount over H2. As a result, the Company now expects Profit before Tax to be in the range of approximately £1.6m to £2.0m for the year. 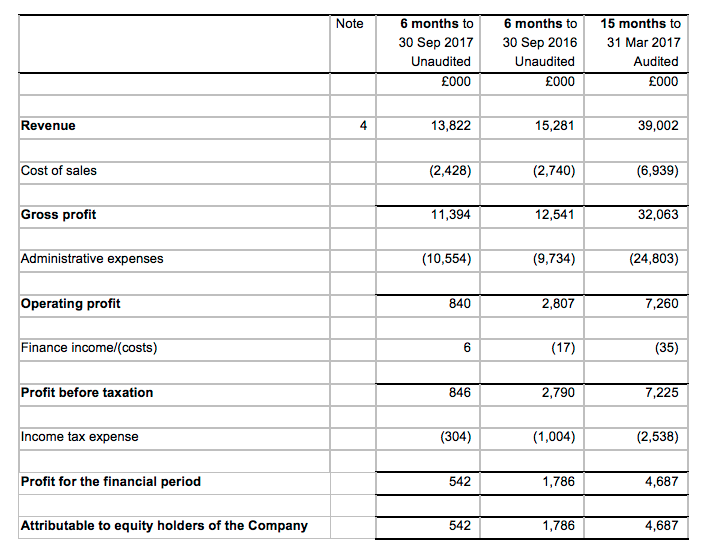 The Company returned £4.2m to shareholders by way of dividends during 2017/18, and yet still had a healthy net cash balance of £5.7m at 31 March 2018 (31 March 2017: £8.3m). SYS1 had previously reckoned the current year would see gross profit down 20% and profit before tax at a “little over breakeven“. Now we are told gross profit fell 18% and profit before tax — following a substantial reduction to staff bonus payments — should come in between £1.6m and £2.0m. The new projection means H2 gross profit fell 26%, from £14,443k to £10,733k, and H2 profit before tax fell between 55% and 74% from £4,435k. H1 profit before tax was £846k, so a £1.6m result for the full year indicates H2 at least matched H1 profit-wise. Total costs for 2017/18 were the £22.2m gross profit less, say, a £1.8m pre-tax profit = £20.4m. Exclude £0.1m for share-based payments and another £0.1m for bonuses and other costs come to £20.2m. Costs for the previous year were the £27.0m gross profit less the £6.3m pre-tax profit = £20.7m. Exclude £0.7m for share-based payments and another £2.3m for bonuses and other costs come to £17.7m. So the reality is that other costs advanced by £2.5m, which is disappointing to see during a difficult year. I would like to think there are further cost reductions to be made. SYS1 mentioned a “reduction in headcount over H2” and I get the impression additional reductions could be needed. The note about the cash position underpins the comments about profit. Cash declining from £8.3m to £5.7m following a £4.2m dividend payment indicates cash of £1.6m was produced during the year. Cash was £3.5m at 30 Sept 2017 and £4.6m at 31 Dec 2017, so it appears both Q3 and Q4 generated cash of c£1.1m. I am not sure if that is a sustainable run rate. But the growing cash position does seem relatively encouraging. The market cap at 330p is £41m, which continues to suggests the market expects earnings to rebound.